With cold days now on the horizon it is essential that health and wellbeing become your highest priority. Active April is all about staying focused on what you have already achieved this year. This blog has and our monthly newsletter have already explained how motivation, commitment and drive can be used in your health journey. Now is the time to put all these changes into effect and stay strong during this time of temptation. If someone offers you an extra piece of cake or chocolate or perhaps just one more drink, this maybe the time to think about it before saying “yes”. We should always ask: is it worth it? Will I be able to exercise tomorrow? Is this on my eating plan? At Melbourne Osteopathy Sports Injury Centre we will help you stay focused and motivated, and teach you that movement is just as essential for your body to stay healthy as the food that you put in to it. If we can keep on track through April you are likely to have a successful, active and healthy winter. Habits = Acts performed regularly without conscious thought or effort. Motivation gets you started. HABIT keeps you going. Good Habits are as Addictive as Bad habits but much more rewarding. They can be good or bad. We can change them from good to bad and from bad to good. Do you know what your good and bad habits are? Bad habits such as procrastinating, laziness, lack of direction, inability to finish tasks, poor eating, and lack of exercise all lead to poor time management, lack of vision and inability to succeed in life. Good habits such as trustworthiness, drive, vision, strategies, and time planning lead to a successful and healthy life. How do we change our habits? Do we want to change all our bad habits? Do not always focus on your weaknesses. You must also consider your strengths. Changing a habit is not easy but can be done using the 3 R’s. Research has shown that it takes 21 days to form a habit. 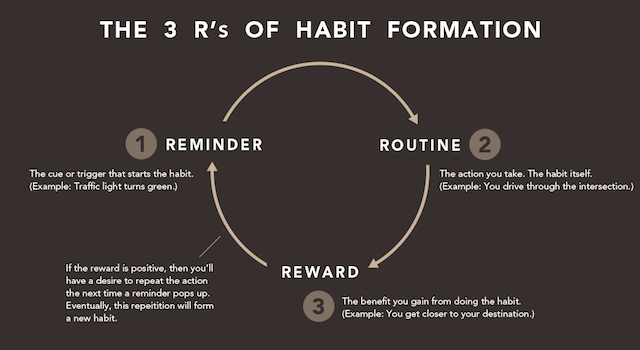 Here are the 3 stages to forming a habit. Trigger or stimulus that initiates the behaviour and reminds us to do it. A good reminder doesn’t rely on motivation or require you to remember your new habit. A good reminder is easy because it trains your new behaviour into something that you already do. For example: if you want to start flossing your teeth then put a reminder note in the bathroom because you will naturally see it each day when you go brush. The action you take or the actual behaviour. It may be hourly, daily or weekly. This is the tough bit, the process of actually trying to achieve your goal. Example: for men at home – always putting the toilet seat down after using the bathroom. The thing that will most likely stop you forming your new habit and breaking your routine is giving up or forgetfulness. This is the best part where you see that what you get out is what you put in. The new habit rewards you with more time and clearer thinking in all aspects of your life. To remove white refined food products from my diet. Reminder – every time I went to prepare or eat food. Routine – avoiding white refined foods. Reward – healthier food, more home cooked meals, more energy, weight loss. Here at Melbourne Osteopathy Sports Injury Centre we are trying to create a healthier and more educated community and this starts with you and your practitioner. This greater community-focused goal is where our practitioners and instructors go from good to great. We refuse to simply focus on pain. We are dedicated to your wellbeing. We deliver continual education about diet, sleeping patterns, proper exercise regimes and how to improve your state of mind (to stay motivated and driven). It is important for you to start asking more questions. If we can help you form a habit now it will stick through all of winter.